The heirs of Emanuel Albert Lewenstein, a collector of the Jewish origin, filed suit in New York City against Bayerische Landesbank (Bayern LB) in respect of the painting, now valued at $80 million. They claim the oil painting Das Bunte Leben (1907) by Wassily Kandinsky has to be returned to their ownership; they believe the artwork is one of the most important in the artist's oeuvre. The plaintiffs insist that the artwork was taken from its legitimate owners in violation of international law and was sold for nothing without permission at the notorious auction in 1940. The artwork is currently valued at $ 80 million. Visitors at the the Lenbachhaus in Munich against the artwork Das Bunte Leben by Wassily Kandinsky. 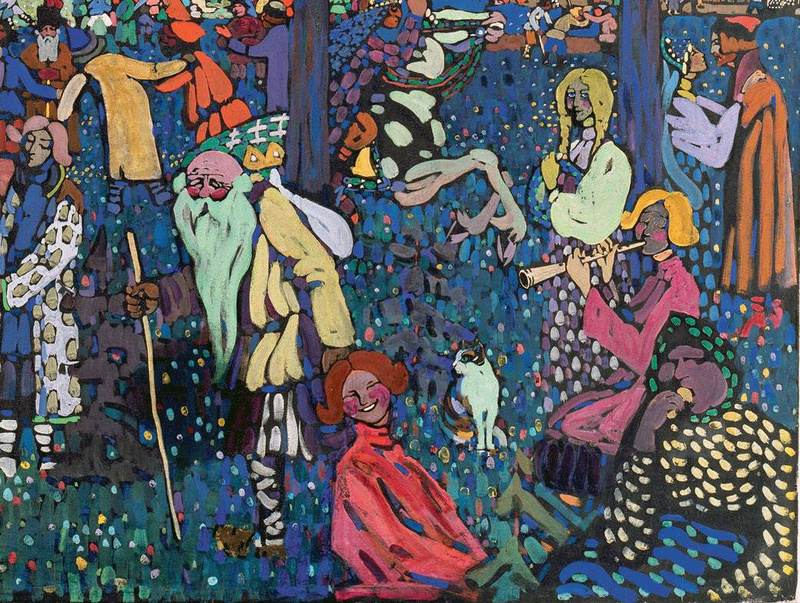 Lewenstein bought Wassily Kandinsky's oil painting Das Bunte Leben (The Colourful Life) immediately after it was created. After his death, his widow Hedwig loaned it to Amsterdam's Stedelijk Museum for safekeeping. After her death before World War II the masterpiece was inherited by her children Robert and Wilhelmina. The both flew from Europe at late 1930s being afraid of Nazi pursuit. In 1940 the painting was given to the auction house selling dozens of artworks looted by Nazis. The Lewensteins insist the painting was sold without their permission along with the works of art from the collection of Jacques Goudstikker, a prominent Jewish art dealer in Amsterdam. That time they paid him 250 guldens making 10 -20% of the real value of the pieces of art. No one of the owners got any sale return. 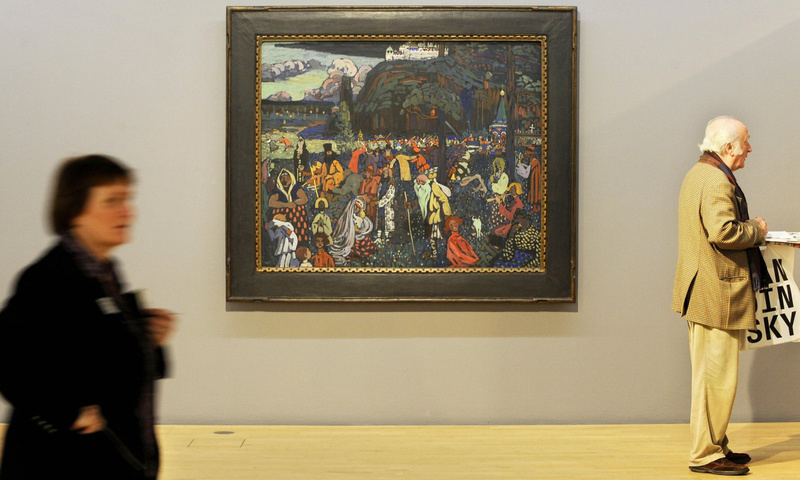 "...Kandinsky fitted into the Munich art community. He studied first at Anton Ažbe's private school and then he entered the Academy of Fine Arts in Munich in 1900, where his teachers would eventually include Franz von Stuck, the great German drawer. In the summer of 1902, Kandinsky invited Gabriele Münter to join him at his summer painting classes just south of Munich in the Alps. She accepted, and their relationship became more personal than professional. They traveled together over Europe. Their romance was the reason of Kandinsky's divorce with his first wife Anna Chemyakina, a cousin on his father's side, who claimed that they both were guilty in their separation. Kandinsky and Munter settled in the town Murnau at the bottom of the Alps. The Kandinsky's artworks of that period were built on the color dissonance, composition of lines and spots progressively displacing the real images...", - according to the artist's biography. 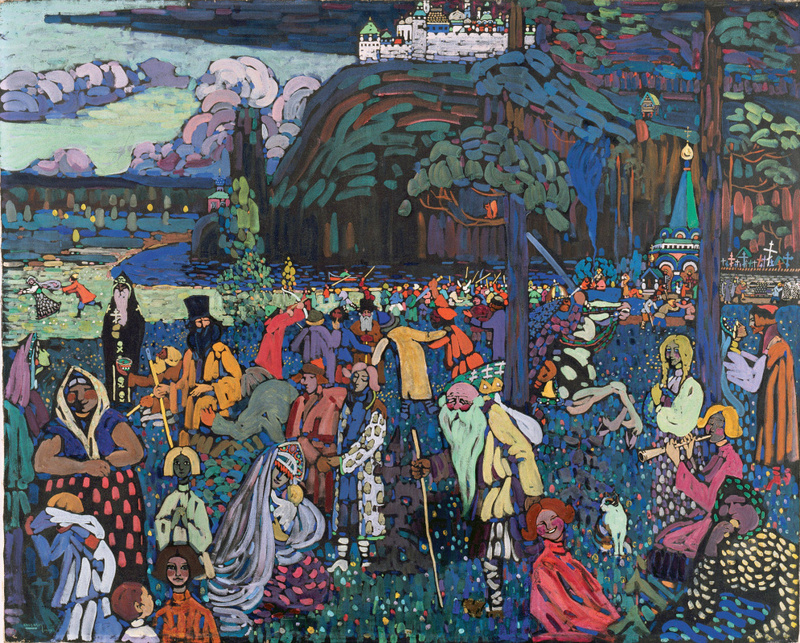 The oil painting Das Bunte Leben (The Colourful Life) by Wassily Kandinsky is currently considered the most significant artwork in the oeuvre by the artist. BayernLB purchased Das Bunte Leben at the auction in 1972 and loaned it to the Lenbachhaus in Munich where it is currently exhibited. The bank agreed to go before the Limbach Commission, the German commission that handles restitution disputes, on the condition that the painting will remain in the museum, even if the commission decides in favor of the heirs.